OnePlus 5 was spotted on Geekbench yesterday that confirmed a couple of specifications like the processor and RAM. Also, the company has already revealed the design of phone from the back, and it looks like if the phone is going to look like iPhone 7 Plus from the back. There are chances that the company is just trolling us hard. Who knows? Anyways, the phone was spotted on GFXbench today with the model number ‘A5000’ and GFXBench has revealed a few more specifications of the phone. 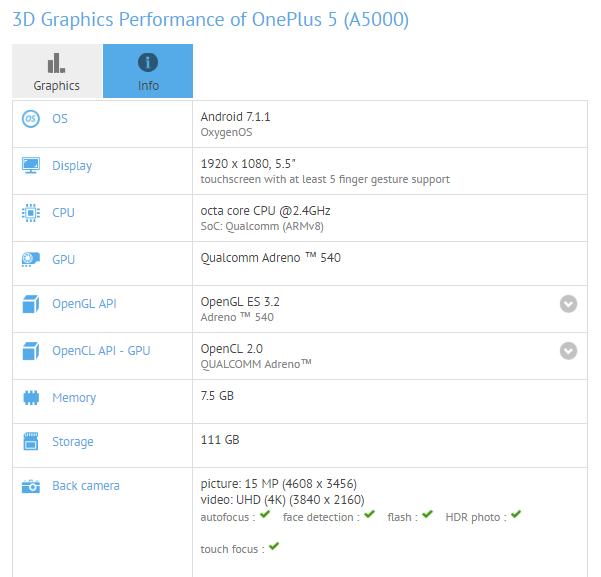 It seems as if the OnePlus 5 isn’t going to feature a Quad-HD screen if we believe on the specifications revealed via GFXBench. It shows the same 5.5-inch 1080p display on the phone. Along with that, the phone runs on Android 7.1.1 Nougat with OxygenOS, has Snapdragon 835 processor and Adreno 540GPU. There will be two variants of the phone with 6GB and 8GB RAM and the one leaked via GFXBench has 8GB RAM. Also, the phone has 128GB internal storage, so there will be two variants with 64GB and 128GB ROM. As per the camera, GFXBench mentions 16MP rear as well as the front camera, so we are not sure if the camera details are correct as there is already a dual camera setup and previous leaks suggested a 20MP+16MP combination. So, the phone is launching on 20th June, and you must be excited, aren’t you?